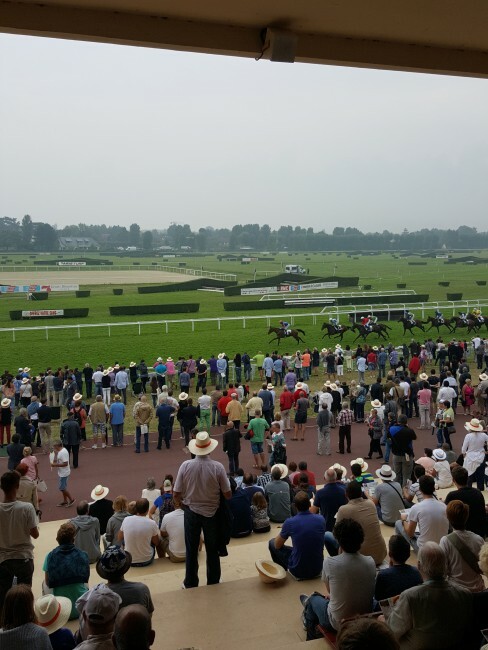 Deauville Clairefontaine racecourse provides excellent racing after a stormy,rainy night. Clairefontaine Thursday 13th August 2015. After a stormy,rainy night racing as usual at Deauville Clairefontaine race course. The talk was of how would Galileo’s progeny The Mystic run in the 1st race Prix Highest Honor. & the Wertheimers’ horse Royal Mania’s chances in the Prix Luth Enchantee. Large fields on the race cards made for exciting racing. The views from the comfortable stands are excellent, & the upstairs Panoramique restaurant served fresh salmon salad.